The nerikiri dough (rice flour and white bean an combo) is as easy to use as playdough. A lot of people have been telling me it reminds them of marzipan, which I've never tried. And I don't know if marzipan can be made with a main ingredient other than almonds, but I do know that neriki can be made with alternate ingredients. 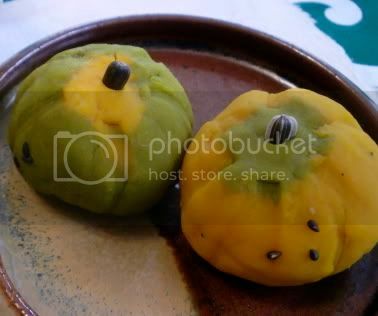 In today's recipe, I substituted pureed kabocha (Japanese pumpkin) for the white bean an, wrapped the resulting nerikiri around a core of red bean an, and molded it to look like a miniature kabocha. I cut one medium-sized kabocha into chunks and microwaved the chunks (loosely covered with plastic wrap) till the orange flesh was tender. When the chunks had cooled enough to handle, I cut away the hard green peel from the orange flesh, and mashed the flesh with a fork till it was a smooth paste. You can do this in a food processor if you prefer. I didn't add any sugar because I thought the kabocha was sweet enough. 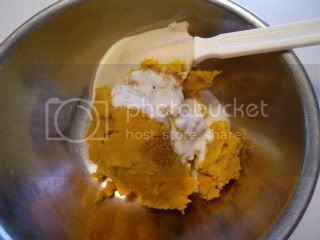 But if you like it sweeter, add sugar as you mash the kabocha. 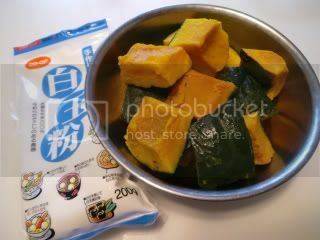 Dissolve the shiratama-ko (rice flour) in a tablespoon of water, and mix it thoroughly into the kabocha puree. 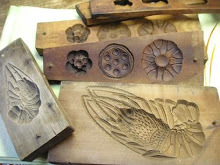 Click here for detailed directions (with photos) for making nerikiri. When the kabocha neriki is the right consistency and cooled to room temp, divide the dough in half. Take one of the halves and knead matcha (green tea) powder into it. 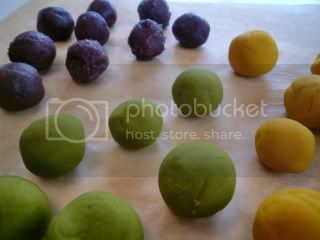 This will color the dough green and add a wonderful green tea fragrance. Roll the tsubuan (red bean an) into ten balls. 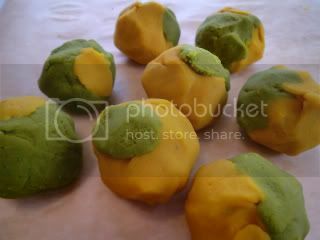 Roll the orange half of the nerikiri dough into about 15 balls, and the green half into about 15 balls. Once again, click here to see photos of how to put three nerikiri balls together in your palm and press them together to form a flat circle large enough to enclose one of the tsubuan balls. Only this time, combine the orange and green so that any one confection will be mostly green (with a dash of orange), or mostly orange (with a dash of green). Pinch pieces off the balls to adjust the amount of color you are aiming for. 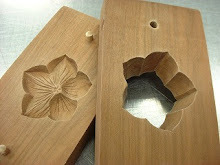 Make sure the seams are smooth and the separate pieces of dough are sticking well to each other. Then press gently down on the top so that each ball is slightly squashed. Use the dull edge of a straight utensil (I used chopsticks) to press dents into the flattened balls to make them look more like real kabocha. I used sesame seeds to express the imperfections in the outer skin of the kabocha, and a sunflower seed to represent the stem.